Many of you are likely familiar with the case of the American student from Berkley back in April of 2008 who when he was taken into custody by Egyptian police managed to send out a short tweet via SMS saying "Arrested." Subsequently his embassy and the press were notified and he was eventually released (see CNN story) thanks to his twitter distress call. Amoiist's real name is Guo Bofeng or Peter Guo, a professional translator lives in Xiamen city, Fujian Province. His regular blog is amoiist.com. Recently he has uploaded the interview of Yan Xiaoling's mother who explained that her daughter was under threat by local triad and local authorities' attempt in covering up the issue. Last night, Mawei police contact Guo's supervisor and told he that Guo was under criminal detention. Many reporters had called up the police station to have fact check on the 6 arrest cases but the police replied: reporters don't have the rights to fact check this case! 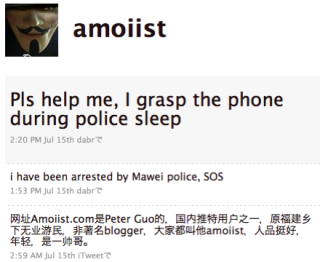 Guo twitter friends continue to update the news via twitter search: @amoiist and #amoiist. What makes Peter's case unfortunate is that his arrest is not yet drawing any attention in the foreign media, and as a result there is no pressure for Chinese authorities to release him. We'll have to wait and see how this plays out. New technology and social media tools are indeed empowering Chinese citizens to speak out where they didn't dare speak out before. But the question remains, is it empowering enough? Update: Looks like the Guardian is the first to run this story. Good to see somebody is taking notice. What's In The Easter Bunny's Basket For 2011?